The "KAPPA Series" is 2-component dispensers for small quantity that have obtained an implicit trust in various industrial fields. As its latest model, we provide the "KAPPA 5". The introduction of a touch panel further improves its operability. The simple body design ensures improved work efficiency and a clean, comfortable working environment. 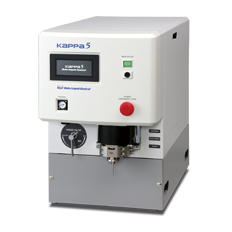 The "KAPPA 5" uses Naka Liquid Control's proprietary volumetric metering type posi-load pump that has an established reputation with numerous results. It contributes to high-precision metering and dispensing since it is not greatly affected by changes in material viscosity. Compared with our conventional models, the "KAPPA 5" has various timers as standard equipment to enhance its functions. Compact and easy-to-operate model that can easily be set up in a small installation space. A miniature high-speed brushless motor with quiet operation sound is used for the mixer, providing more comfortable working environment.